Diamond rings can have an extravagant look, be sturdy and long lasting and still, not cost a fortune. Quality takes center stage in every jewel crafted by Kai Silver. This remains true no matter what gemstones and metal you choose. The RG180 is a ring that will look equally good on men and women. The ring has two diamonds set vertically in the band, you can choose from 2.5mm or 3mm diamonds. 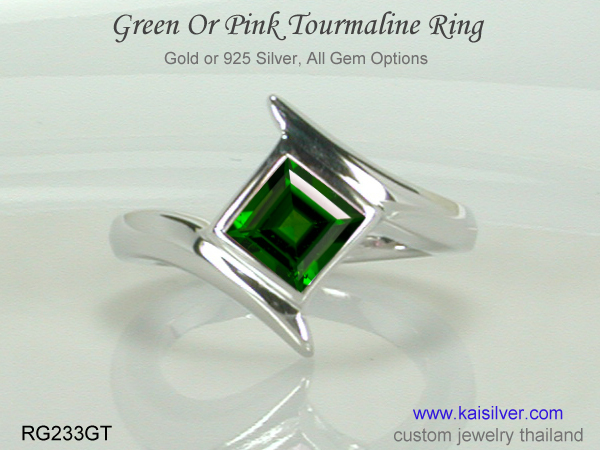 Since this is a custom ring and not mass produced, you can request for design updates based on your preference. You could for example, go for princess cut (square) diamonds instead of round ones. Diamonds have defined style and status for centuries. Few of us would not love to wear a gorgeous diamond ring, affordability is generally what holds back many buyers. Diamonds are hard and can last for generations, scientists confirm that there is no natural creation that is harder than diamond. The brilliance of diamond combined with its hardness, makes it perfect for a special occasion like an engagement or wedding. It is also true that most of us allocate a higher budget when it comes to matrimonial jewelry. 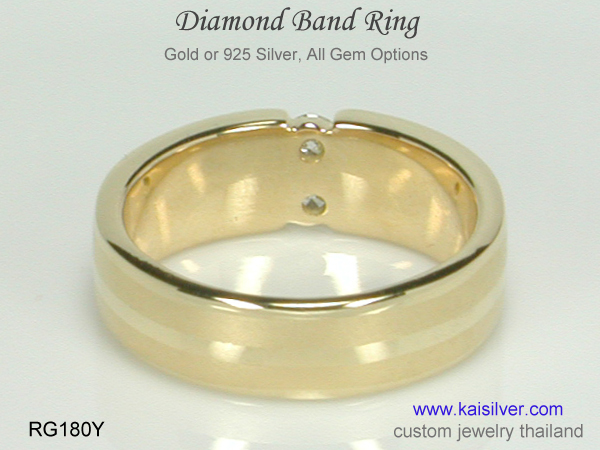 The RG180 gold or 925 silver diamond ring from Kaisilver, has a good metal weight of around 10 to 12 grams. Larger ring sizes might require a higher weight. The images show the ring with a solid band, no scooping done inside the band. If you would like to have a solid band with no scooping for your ring, let us know at the time of ordering. The support team will work out the metal weight required based on your ring size. The ring as shown above has a slight taper for the band width, you could order the same ring with a uniform band width. This requirement might call for an additional metal weight. We will calculate required metal weight based on the ring size that you need. Each diamond ring is custom made in gold and sterling silver. You can order a 14k or 18k diamond gold ring. Available with diamonds or gemstones, or a combination of both. Diamond size can be 2.5mm or 3mm, gemstone size is 3mm. Request for a price quote, if you prefer square (princess cut) diamonds. The RG180 diamond ring can be ordered in all ring sizes. We can also custom make a diamond ring with your design. The ring has a head height of 6 to 7mm, the width behind the finger is 4mm. The metal weight of the diamond ring is around 10 to 12 grams. Larger ring sizes might require more metal weight. Let us know if you need a solid band with no metal scooping inside. The ring can be crafted as a band ring with uniform band width all around. The diamond grade is VS1 with a color range of G-I. Durability: Most buyers check the external appearance of a diamond ring before, looking at the price tag. 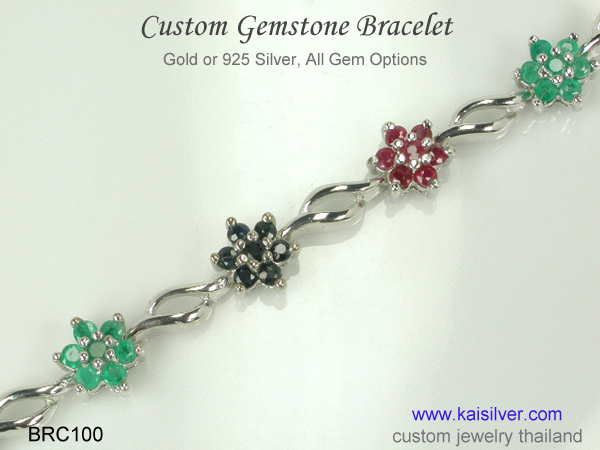 The experts at Kaisilver are fully aware that, it is not just external beauty and price that define a quality jewel. The good metal weight practically eliminates the chances of the ring bending or getting deformed. The diamonds or gemstones in this ring are recessed into the ring. Stones that protrude are more likely to get hit by physical impact. Popular request for the diamond ring to be made with uniform band width. Buyers have frequently ordered this ring with a combination diamonds and gems. 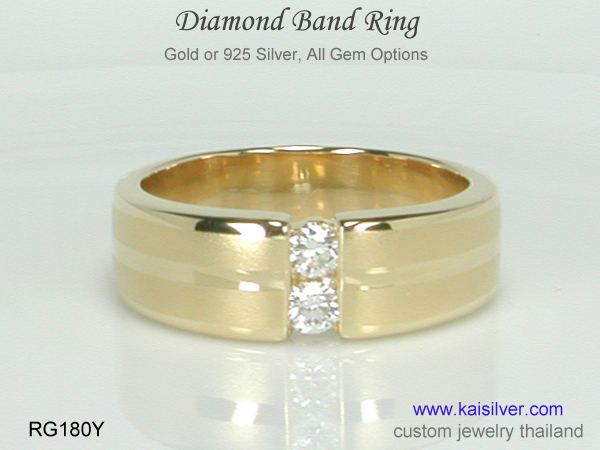 For a wider band width, it is possible to include 3 or even 4 diamonds. Many orders have come with a request for a solid metal band (no scooping). Some buyers prefer a complete dull or complete high polish finish on the band. Etching of a name, initials, date or a short message inside the band of the ring. Men's diamond rings are often being ordered with square (princess cut) diamonds. 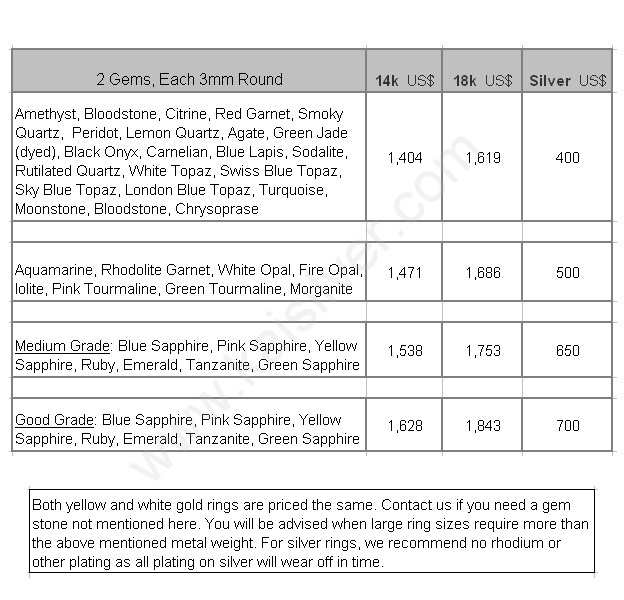 Gem and diamond sizes requested range from 2.5mm to 4mm. 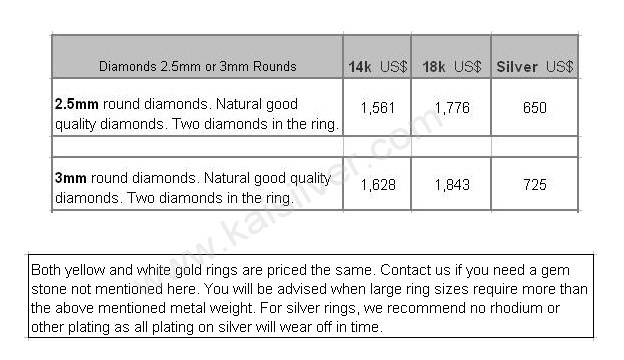 How To Buy: If you are interested in this diamond ring or any other jewel from Kaisilver, do not rush yourself. Fine jewelry was never meant to be purchased on an impulse. 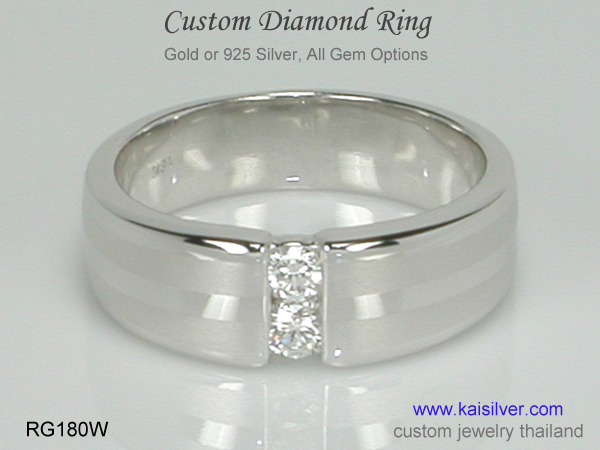 Discuss your requirements with our team at sales@kaisilver.com they will come up with suggestions and options. The metal weight will be optimized for your ring size and other dimensions. We encourage you to keep asking questions until, all your queries have been answered. There is a production period of 4 to 6 weeks from the date of order confirmation and receipt of payment. We prefer Paypal as the mode of payment but can also accept Western Union. If you happen to be a first time buyer, you would be more comfortable using Paypal. Let us know which mode of payment you prefer, we will provide details for the same. 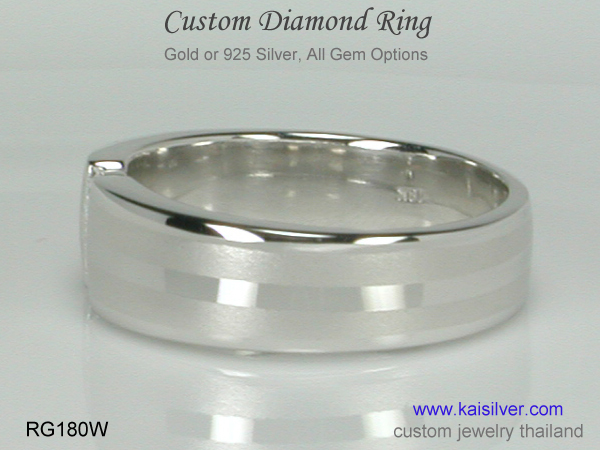 Kaisilver: Rated as the most sought after online source for high end custom made jewelry, we craft jewelry with your designs or ours in gold and sterling silver. The same team of highly skilled artisans and craftsmen from Thailand, work on all orders irrespective of the metal or gemstones selected. Gem miners and cutters across the globe open up their fine gem collections, giving us priority access to the best gems at every price point. We do not restrict your choice of design or gemstones, you are not limited to what you see on our website.